Last Sunday, December 7th, was our wedding anniversary - 18 wonderful years. Yes, it is also Pearl Harbor Day. Carl and I and Pete and Carol all decided to go for a little adventure for the day. We started at the local Denney's restaurant at 7 am for Carl's ritual "big breakfast". After that we drove up the 210 Freeway to the 5 then to the 126 and turned off towards Fillmore and Santa Paula. 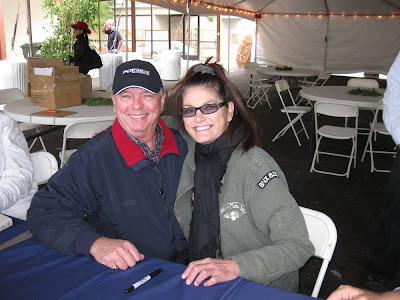 We had read about an event going on at the Santa Paula airport. Steve McQueen used to hang out there about 30 years ago with his young bride Barbara. Barbara wrote a book about Steve's life during their time together, which was about 3-1/2 years. 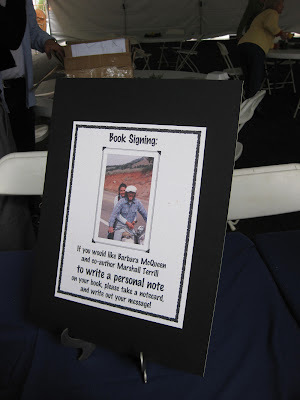 She was there at the airport, selling and signing copies of her book - "Steve McQueen - The Last Mile". 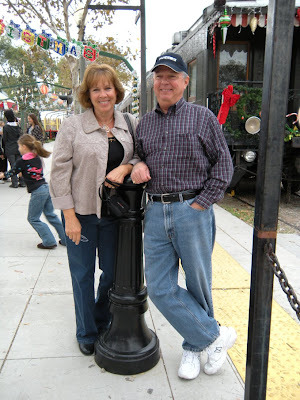 Carl's mom, Hilma, grew up in Fillmore, California. She told me so many stories about that place and how much she loved it. There was a dam break in 1928? the St. Francis dam, and it flooded all of Fillmore and Santa Paula. She was there when it happened, but luckily lived along the foothills so her home was spared. I had to stop to see Fillmore. What a wonderful little old town. The town was having a Christmas Train ride to go cut down their Christmas trees. There were carnival rides and kids everywhere; so excited to get on the train. The depot is right next to City Hall. Carl and I in front of the Christmas Train. 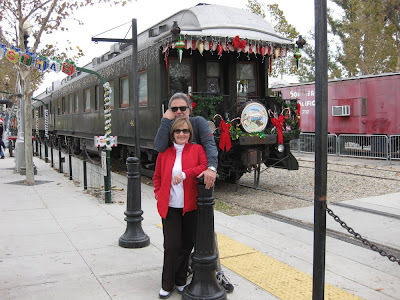 Pete and Carol in front of the train. This is Fillmore City Hall. 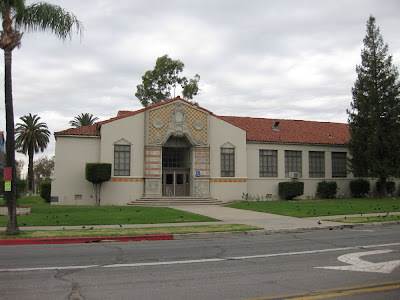 Here is Fillmore High School. Hilma attended her 60th HS Reunion there and was an alumni active member until her passing. 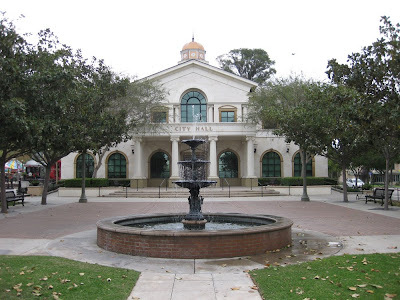 Carl and his brother, John, used to visit their aunt and uncle in Santa Paula during the summers of their childhood. Their aunt and uncle managed a citrus farm and the boys would stay for 2 weeks and sleep in the barn. 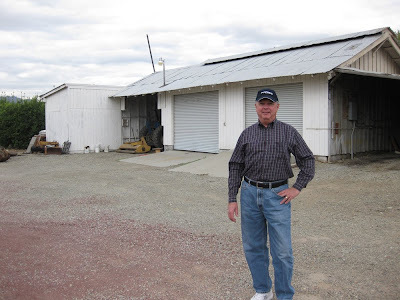 Here is a picture of Carl standing in front of the old barn. So - yes he was raised in a barn. The farm is still a working farms and all of the old buildings and houses still stand. Barely. 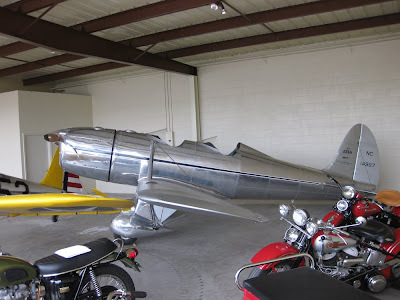 We made our way down the highway to Santa Paula and to the old airport. It just about touches the freeway walls. 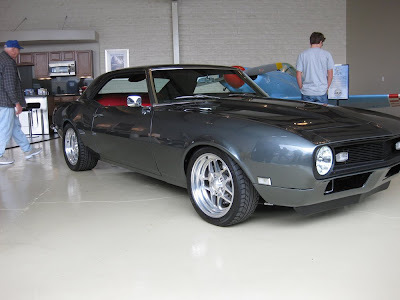 This is Steve McQueen's airplane. A neat looking silver plane - I know Nothing! about airplanes. 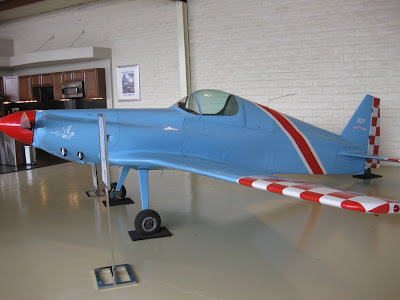 And .... a Blue and Red airplane. Then - the book signing. Can he look any happier??? She's a nice looking lady and was a real hottie when she was married to Steve. There are many pictures of Barbara in the book. She was a top model at that time. A very nice gal and said some special things to Carl - notice how red his skin is. Carl's friends are everywhere. 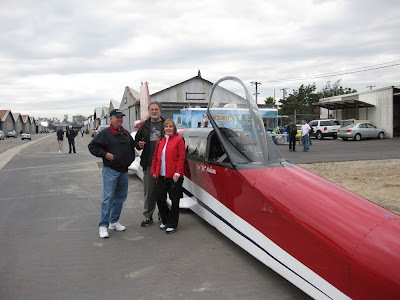 His buddy, Jim Neilsen, a jet car driver was there with his latest jet car on display. 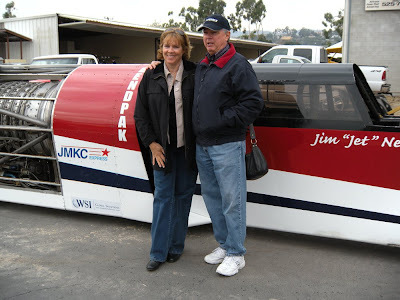 Jim went to Japan on the same trip that I was on, running his jet car limo. Carl and Pete and Carol were checking it out. 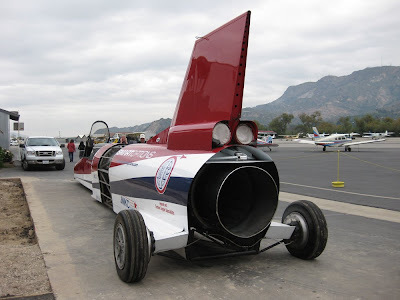 A rear shot of the jet car. 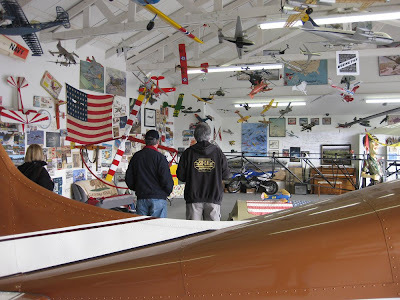 Every first Sunday of the month, the Santa Paula Airport holds an open house. 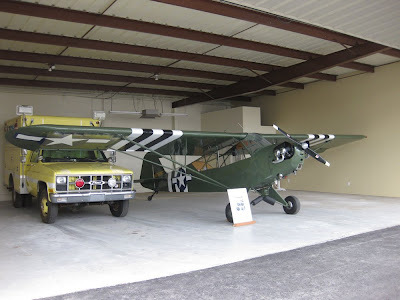 All of the private hangers are open to the public to show their vintage aircraft, motorcycles, cars and collectibles. This particular hanger WINS for most stuff! He had toy planes hanging from the ceiling, display cases along the walls with models, toys, books, puzzles - you name it - it was there. 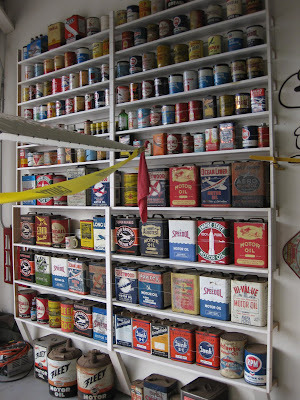 He had a cool collection of old oil cans. 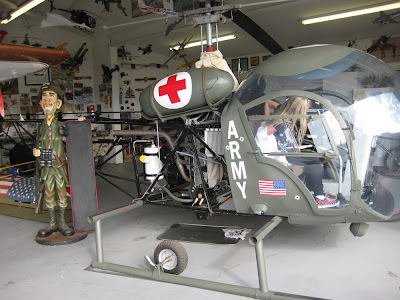 He even had a helicopter inside. We walked up and down the rows of hangers as airplanes took off and landed, constantly. 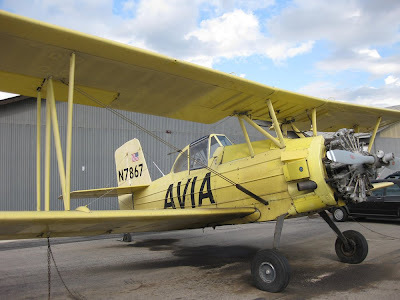 Here is an old crop duster. 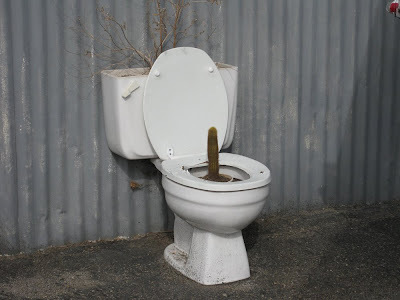 There was some interesting art decor. Here are some video clips of airplanes taking off and landing. After Santa Paula we continued towards Ventura and stopped by Roy and Lisa's new condo at the beach for a few minutes. We had a great day!